* Handy folder for saving historical Presidential dollar coins. * Pre-cut holes hold coins securely in album (coins not included). * Coin slots represent deceased presidents (only). * George Washington through Ronald Reagan. * Excellent gift for coin collectors of all ages. * Album measures 6.25"W x 8"H.
Dansco Coin Albums have been a longtime companion for both expert numismatists and beginning coin collectors. 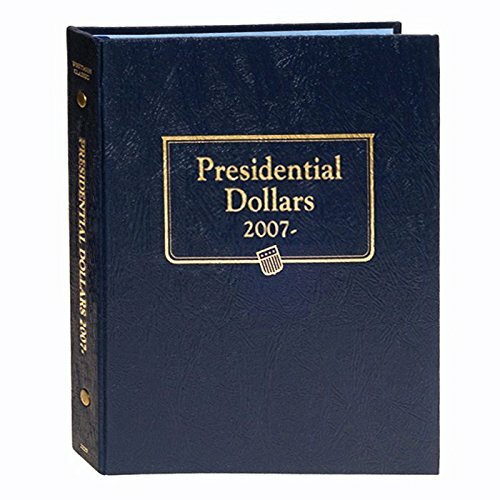 The Presidential Dollars 2007-2015 Date Set Dansco Album comes in a 1" binder and holds up to 45 coins. 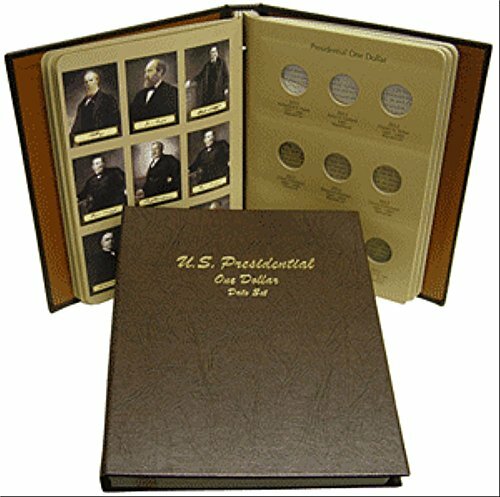 The album has 5 Dansco pages (series: 7186-1 to 7186-5), each one holding and displaying Presidential dollars minted from 2007-2015. The Presidential $1 Coin Program honors former presidents of the United States. Beginning with George Washington, each year the U.S. Mint releases four new coins with portraits of the former presidents on the obverse. The reverse of the coin shows the Statue of Liberty. The program stipulates only deceased presidents are eligible to be honored in the program. The motto "In God We Trust" was controversially placed on the edge of the coin. Some 2007 Presidential dollars were mistakenly issued without lettering on the edges, and the U.S. Mint then decided to place the motto on the obverse. Presidential dollars have a pure copper inner core and an outer layer made of 77% copper, 12% zinc, 7% manganese and 4% nickel. They measure 26.5 mm in diameter, and each weighs 8.10 grams. Dansco Coin Albums have their pages attached with metal screws, making it easy to add and replace. 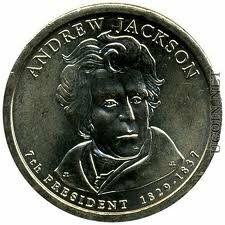 2008-P Andrew Jackson Presidential Dollar Coin (1829-1837), 7th U.S. Here is your opportunity to own or to gift the hologram ABRAHAM LINCOLN 2010 Presidential $1 U.S. Coin. To highlight the original design, the Merrick Mint has beautifully hologram enhanced both the obverse side and reverse side of the coin using a unique authentic process. The result is an everlasting hologram coin collectible of ultra-high quality that is #1 in the industry. Each coin comes in a premium coin capsule with a full color Certificate of Authenticity to guarantee that your coins are authentic and recognized by every monetary authority around the world, assuring its Collector Edition status. MAGA (Make America Great Again). 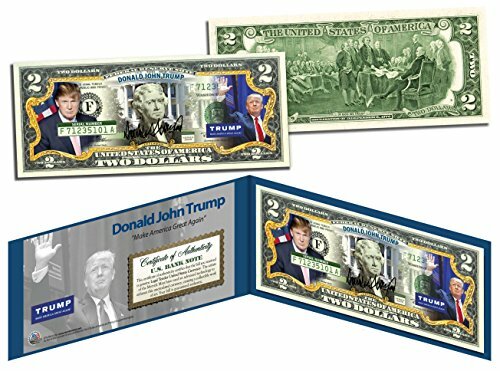 This DONALD JOHN TRUMP uncirculated $2 Bill is Genuine Authentic Legal Tender of the United States, which has been enhanced with beautiful colorized images. The full colorized images are accomplished through a revolutionary new authentic & genuine colorization process pioneered by The Merrick Mint. Included is a Certificate of Authenticity. Only genuine Legal Tender $2 United States Bills are used for this unique colorization process. Each $2 Bill is in FRESH, CRISP, UNCIRCULATED condition, and was directly removed from untouched wrapped Federal Reserve sealed packs. Strong, soil-resistant Whitman albums with blue textured leatherette cover are designed with thumb notches for easy window removal. 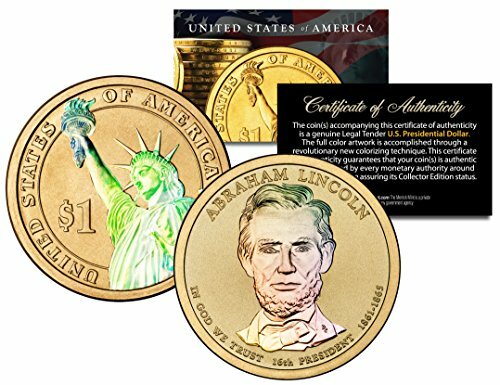 The Presidential $1 Coin Program honors former presidents of the United States. Beginning with George Washington, each year the U.S. Mint releases four new coins with portraits of the former presidents on the obverse. The reverse of the coin shows the Statue of Liberty. The program stipulates only deceased presidents are eligible to be honored in the program. The motto "In God We Trust" was controversially placed on the edge of the coin. Some 2007 Presidential dollars were mistakenly issued without lettering on the edges, and the U.S. Mint then decided to place the motto on the obverse. Presidential dollars have a pure copper inner core and an outer layer made of 77% copper, 12% zinc, 7% manganese and 4% nickel. They measure 26.5 mm in diameter, and each weighs 8.10 grams. 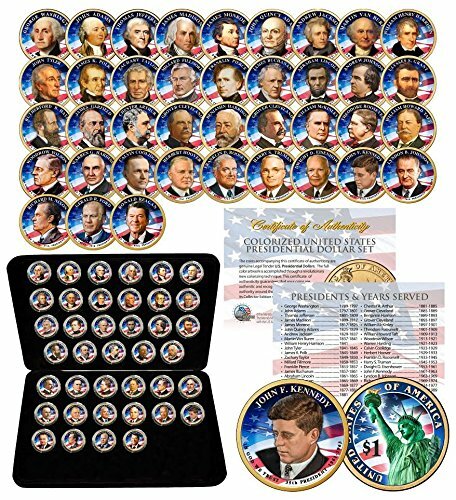 Looking for more Us Presidents Dollar Coins similar ideas? Try to explore these searches: Hollow Sway Bar, Dutch Wooden Shoes, and Dog Ear Pickup Cream. Look at latest related video about Us Presidents Dollar Coins. Shopwizion.com is the smartest way for online shopping: compare prices of leading online shops for best deals around the web. 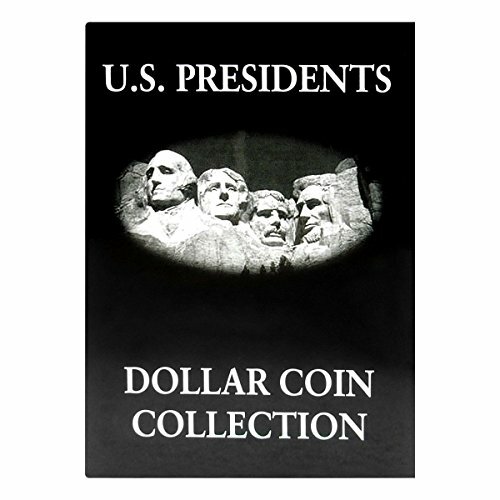 Don't miss TOP Us Presidents Dollar Coins deals, updated daily.